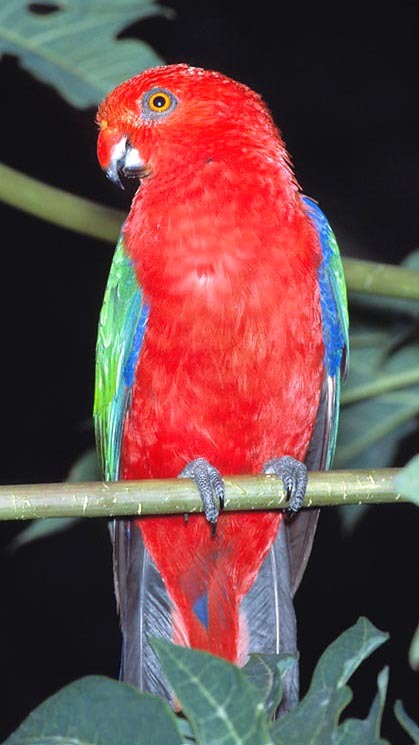 The King Parrot or Moluccan King Parrot (Alisterus amboinensis Linnaeus, 1766) is one of the most colourful members of the family of the Psittacidae. The genus includes also the Alisterus chloreptus and the Alisterus chloreptus moszowski, discovered only in the twentieth century. At home in the Moluccas Archipelago, Indonesia, New Guinea and Philippines, the Alisterus amboinensis is nowadays commercialized and is present in all continents, although it has been inserted by the IUCN into the red list of the Threatened Species and the CITES controls its traffic. A sad popularity, surely caused by its plumage, which has deserved the animal a name also ion far-away countries: “Perruche tricolore” in French, “Amboinasittich” in German, “Moluccan King Parrot” or “Ambon King-parrot” in English and “Papagayo Moluqueño in Spanish. The species has its highest density of population in the island of Halmahera in the northern Archipelago of Moluccas. Usually, these parrots live in woods with a soil poor of nutriment. For what the alimentation is concerned, this is similar to its relatives’: fruits, berries, buds and a variety of seeds, therefore it has an alimentary regimen of frugivorous, granivorous and phytophagous type. In New Guinea, it is found also in the fields at the sea level. What is sure is that the population of the species is rather limited, and therefore under threat, also because till now we have not yet been able to get them reproduced in captivity. At the Zoological Garden of Loro Parque in Tenerife, Canary Islands, the biologists Dr. Burkard and Dr. Gerlach have formed, for this purpose, huge colonies, but from 1972 up to now they have not been successful. On the other hand, also the data about courting and reproduction are scarcely known. It is thought that the heat season lasts from the beginning of summer to the first part of autumn, with three depositions. Like other species of Psittacidae, the males should build up the nests, showing a certain nervousness and aggressiveness. Even if the data are not completely sure, each clutch should carry from three to eight eggs (on an average of 5), incubated by the parents, by turns, for 21 days. The new-borns, called pullets, are awkward, with a very big head and enormous eyes which open around the fifteenth day of life. During the first week, they can stay with the neck stretched and the beak wide open for many hours, waiting for the nutriment which will be regurgitated by the father. During this time the pullets are wrapped by a thin, temporary plumage, of a greyish white colour, well different from the bright red-green-blue colours they will have when sexually mature, probably by the third-fourth year of life. By the third week of life, they become autonomous, fit for flying and leave the nest. Moluccas Archipelago, Indonesia, New Guinea, Philippines. They are very selective while researching their ecological niche. Their natural habitat is the pluvial forest where they carry on an arboreal life, but the increasing human pressurization has created, with the deforestation, a really difficult situation for the species for finding its biotical room, obliging it to adapt even more to other habitats, such as shrubby areas and fields close to the seaside. It often lives in crowded and rowdy colonies. When in captivity, these parrots have initially a shy attitude, but with the time they get affectionate to their masters, as they are very interactive and easy to be trained. They do not appreciate low temperatures and need sunny and spacious aviaries, where they can fly at ease. Absence of chromatic sexual dimorphism between male and female. 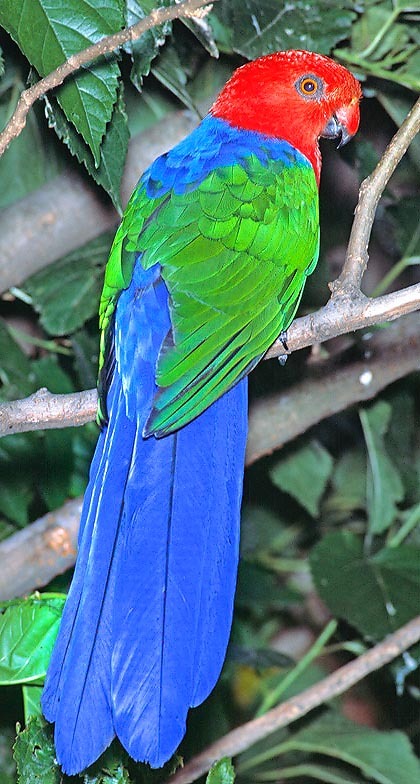 Both have bright colours, which are the brilliant green of the feathers covering the wings, the great remiges are black, belly and head are bright red and the back and the tail are of a bright cobalt blue colour. The beak is of average dimensions. It is orange-red with black edge and point in the upper part, blackish dark in the lower one. The iris is orange, the foot zygodactyl, seen its arboreal life. They are long up to 36 cm, weigh between 80 and 105 g, and live up to 20 years. The two sexes do not display any somatic sexual dimorphism. As a consequence, for establishing the same we have to effect molecular and karyotypic checks (through analysis of the DNA of the feathers and of the karyotype) or a laparoscopy, when the sexual maturation is reached, coinciding with the moulting to the final plumage, which takes place between the third and fourth year of life. A said before, we have few knowledge about the reproductive biology of this species, both in the wild and in captivity. The IUCN and the CITES calculate that in the zones where these birds are endemic, there are about 5.000-7.000 specimens and seen their low birth rate, associated with the continuous regression of the habitat caused by the man, the Alisterus amboinensis are classified since 2001 as Threatened Species.